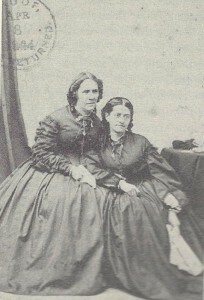 Philena (1822-1898 ) and Phebe (1831-1880 ) McKeen, daughters of Vermont clergyman Silas McKeen, were invited to Andover in 1859 to become respectively the Principal and Assistant Principal at Abbott Academy. They were later called, by one admiring trustee, the school’s “binary star”. Philena was thirty-nine years old in 1861, and befitting her position, was the more serious and authoritative of the two. She spent her summers in Bible study and research in the history of Art. “Miss Phebe” was thirty years old at the outbreak of the War and described as “eminently social and delighted [by] games and charades.” Both sisters were unmarried, and regarding the Abbot girls as family, took personal responsibility for each child’s character, behavior and religious conversion. Phebe McKeen wanted very much to become a wartime nurse, but was told firmly by her father that she could be of more use remaining at Abbot. She threw herself, as well as her students, into war work. The girls sewed flags, knit socks and wrote letters to convalescent soldiers. After the war, they participated in the floral decoration of Andover soldiers’ graves.